From the Bride…David and I knew that we wanted the beautiful mountain views from our Fallbrook home to serve as the backdrop for our wedding day. The only issue was that our backyard was not landscaped or properly graded for our dream Al Fresco wedding. So, we immediately began a full-scale backyard project that included an infinity pool, extensive grading, landscaping, and hardscape. This put us in the unique position of designing an outdoor living space to enjoy for years to come while also creating the stage for our big day. Lucky for us, our visionary and daring wedding coordinator (Christy from To La Lune) was on board and the rest of the vendors that made for a design dream team followed suit. The overall style we were going for was old world elegance with a contemporary twist and we drew inspiration from the mountains that surround us as well as the moon that shines above them. 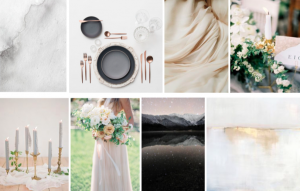 Our color palette consisted of a variety of creams and soft grays accompanied by moody tones of deep indigo and dark grey along with pops of blush and golden yellow hues. From the impeccable table settings, to the floral lined aisle, to the custom hand painted guest favors, to the modern acrylic pieces, and the romantic hand calligraphy, we loved how every thoughtful detail came together. The design truly was a labor of love and collaboration that beautifully reflected our personal style. And all of the above was made that much more intimate because we were able to share it with our closest loved ones in the comfort of our own home.